The Quartzsite shows are famous among professional and amateur lapidaries and jewelry artists. The small desert town lies about 18 miles east of the Arizona-California border, and about 250 miles northwest of Tucson. A quiet town of about 3,000 year-round residents, that population explodes during the January-February show, making Quartzsite a vibrant outdoor desert shopping mall. About 3,000 vendors from all over come to Quartzsite to sell virtually anything and everything, including serious dealers (about 500) of rocks, minerals, gems, fossils and jewelry. Of the ten or more shows happening simultaneously, there are four that are strictly rock and mineral related: Desert Gardens Show, QIA Pow Wow, Prospector’s Panorama, and Tyson Wells Show. Prices are notoriously cheap — compared to Tucson, where costs for many of the same items tend to be quite higher. All shows have free admission and parking — though very difficult to find — and no registration is required. 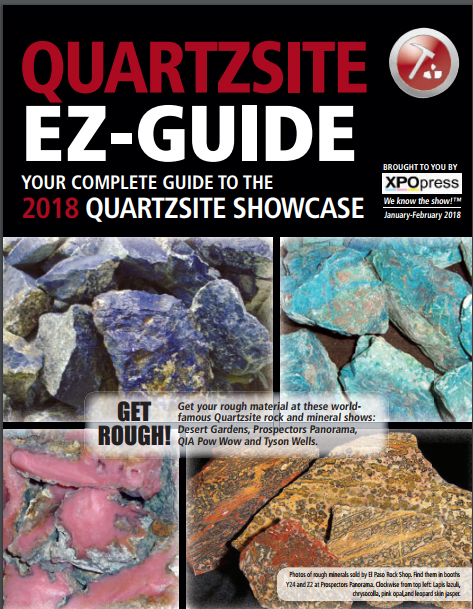 Download the Official Guide to the annual Quartzsite Showcase & Swapmeet. The full-color, 25,000-circulation Quartzsite EZ-Guide promotes the 10 shows and various swapmeets open for business every December thru February — publishing show dates, hours, addresses, contact information, floorplans and maps, and a complete list of every dealer and vendor at the shows, and some great articles for readers to enjoy. This guide is distributed on special racks at all of the shows and many local businesses during show time each year.